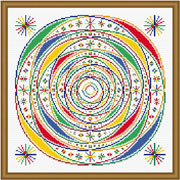 Different size colorful stars and shapes (planets) are featured in the spaces between the circular ‘orbits’. Shades of basic colors are used. Floss may be changed. Whole stitches are used.